Since I stayed home for Christmas, I challenged myself to assemble the Tavern Blues' blocks. I knew this quilt was large, but finding an adequate space to lay out the blocks and sashing required moving some furniture. I started Tavern Blues on January 23, 2107, so I'm pleased that I "might" have it finished by the end of January 2018. "Might" is the key word in the previous sentence. 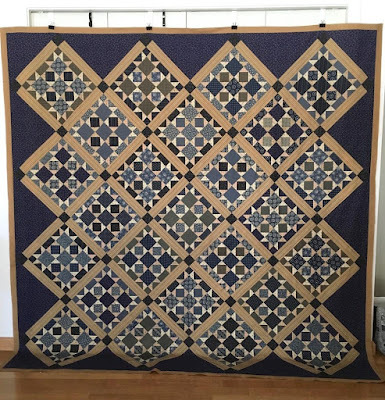 You may remember that I didn't purchase a kit for this quilt and that I amassed collected the fabric over a period of time without consulting the pattern. The only problem that created was too much fabric for the blocks. Fast forward to December 2017 when I get serious about assembling the quilt. 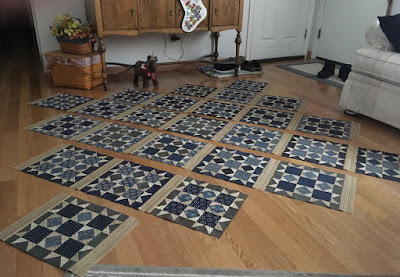 I open the box that contains the fabric for the sashing, the setting triangles, and the borders and discover a major glitch: I hadn't purchased enough yardage for the final border - I hadn't even purchased half of the yardage required for the border. To put this in perspective, I started collecting the fabric nearly five years ago when the pattern was released. The border fabric was in quilt shops over five years ago, and the chances of any shop having the yardage now was nearly non-existent. Optimist that I am, I began my search online, and after several hours of searching, I had only ONE hit - a shop in Longview, WA called Momma Made It. 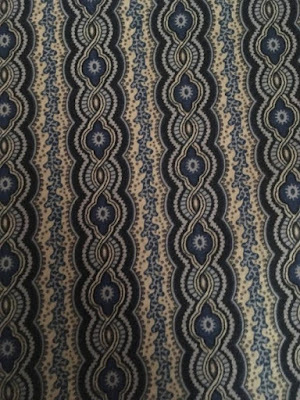 I called the shop and discovered they had 1 and 2/3 yards available - combined with the yard I had, it's still short of what I need. I definitely will not be able to miter the corners, but I'll be okay with that if I have enough yardage for the border with corner stones. The fabric arrived last Saturday. Now, I need to tediously sew this yardage to the piece I already had, and hope that the joins are not too obvious. I'm keeping my fingers crossed that I have enough fabric for the outer border on the quilt that should be renamed, Nancy's Folly. What a story!! That final border fabric is gorgeous - so glad you were able to find sufficient (optimist that I am!!). Your determination is admirable and the quilt will be spectacular. I'm glad you were able to find the missing fabric. The game of "fabric chicken" is on. Good luck. Glad that you were able to find as much of the fabric as you did. oh But I love it. I love the blues. I can see why it captured your heart a few years ago! Wow!! That is a spectacular quilt. Are you keeping it for yourself? It’s beautiful but not a folly. It shows your perseverance. It’s kind of like yarn chicken except with fabric! Have fun. Wait a minute... you do know that a problem with fabric requirements is really just a creative opportunity, right? I do feel your pain, especially since that is such a perfect border print. Will this be gracing your bed? This is stunning no matter what you name it! Great work! 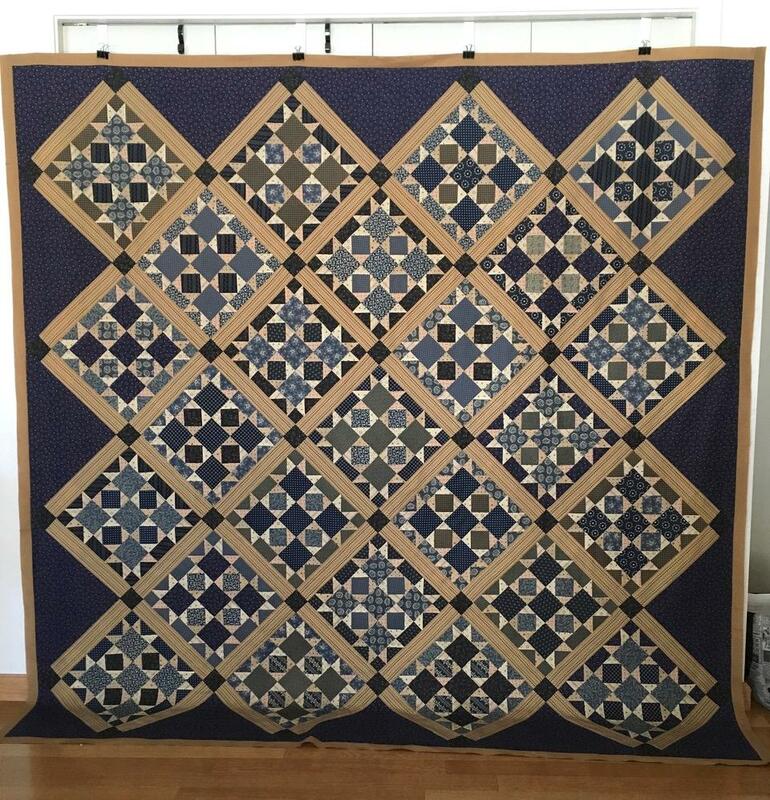 Love the calming colors in this quilt. Have you ever tried equilter? 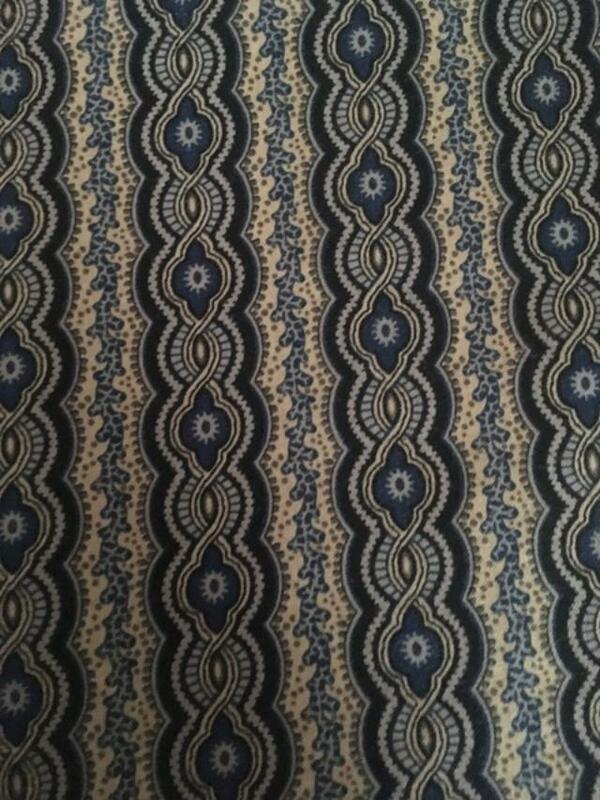 I've been able to find fabric there that's no where else. I think it's amazing that you found the fabric. I still do not understand how people manage such big quilts. I imagine it will make more sense to me when I master smaller ones. Oh Nancy, I'm so pleased you found the fabric, but regardless, it's a magnificent piece! I love the photo of the blocks on the floor! Gosh that is a BIG quilt. Thank goodness you found the fabric to finish. I like this quilt a lot. Thank goodness you found the fabric!!! That was a close one! Can’t wait to see the finished quilt! It is gorgeous! Oh, my goodness, this is one gorgeous quilt!